You will note from the Sidebar Of Shame that the Sockapalooza Java Leaf socks are completely, 100% finished. I really love these socks, but I was ready to have them off my needles. Because so much other lovely sock yarn has been coming my way lately. And it’s been calling to me. Calling loudest was the Koigu I picked up last Sunday at the PDX Knit Bloggers meet-up. Although it was safely stored away in it’s designated stash bin, I could hear it banging against the sides trying to get out, and I could hear a faint voice crying I know what I want to be so let me out and I’ll show you! I know how yarn can be. It… prevaricates, shall we say? OK. Sometimes it downright lies. But I, a trusting and naive soul, am ever ready to be led astray by a pretty face and an insistence that it knows what’s best. I swatched the Koigu. It lied. But I’m swatching some more because it is lovely and I want to knit with it. It sucked me in, all right. Pics of the Java Leaf socks tomorrow, when it should be cool enough to go outside and take some. And I’ll report on the Kiogu swatching progress also. But first… (drum roll please)… Boston. This beach lies just across the street from my cousins’ home. I’m not kidding. Directly across the street. This is the view that they get up to every morning and go to bed to every night. There are much worse things to look at, I’m thinking. 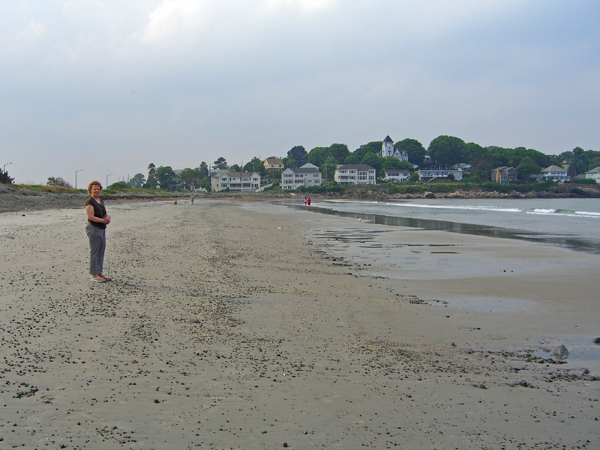 That is my muggle cousin Margaret, strolling along the beach and picking up a few of the shells that are literally strewn about everywhere. I walked on this beach every day. It was wonderful! Thanks to everyone who sent suggestions of places to visit. I only had one afternoon in the city, and since we rode the T (that’s what Bostonians call their subway), I tried to pick out the ones that were closest to T stops. So that was a little limiting. I would have loved to have made it out to Webs. Maybe next time. I wish I could show you a picture of the inside of this shop, but all of the ones I took were totally craptastic and would in no way represent how fun this store actually is. They have an entire wall of button. Can you imagine? A whole wall. 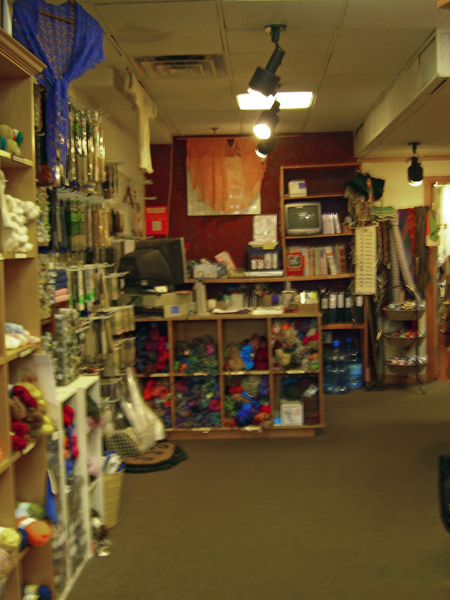 And the other side of the store is all yarn. Lots of yarn. More yarn than it at first appears. I kept turning corners and finding yarn stuck away in a little nook or cranny that I didn’t expect. 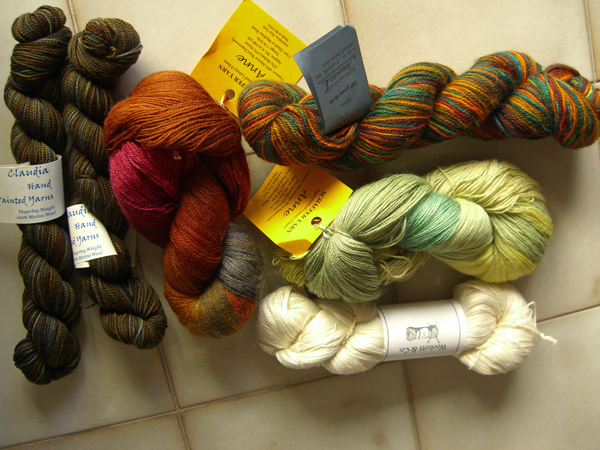 I tried valiantly to limit my purchases to only yarn that I can’t get easily at home. 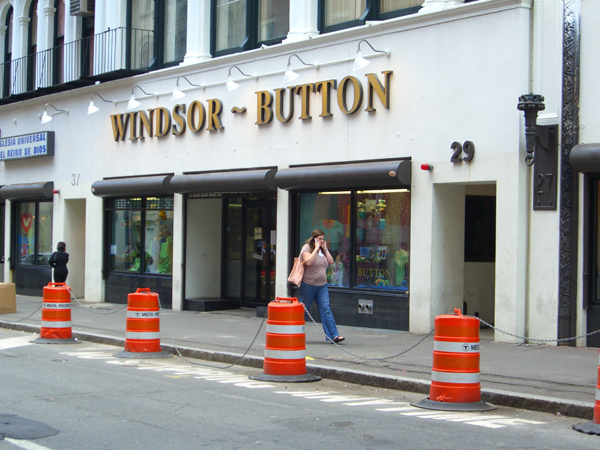 At Windsor I mostly succeeded. But I did point out the Seasilk to Margaret. Me, stroking a hank of Seasilk or two: Look at this suff. Can you believe it’s made of silk and kelp? Margaret, from a distance: No! Really? It’s pretty. Me, holding out a skein: You really need to feel this, to see how lovely it is. Margaret, touching the tip of one finger briefly to yarn: Yes. Very nice. Woman Behind Windsor Counter: Don’t you love Seasilk! It smells so good! So… sea-like. It’s OK. She’s a muggle, but willing to venture into unknown territory. The other shop I visited was Woolcott and Company. I had a wonderful time browsing amongst all the yarn here. This picture is craptastic, also, but it’s unfortunately the best I took. Do you see that pink lace shawl hanging over the counter in the back? That is one of the most gorgeous pieces of lacework I’ve ever seen. I really, really, really wanted that pattern. But Sean said that he is absolutely unable to keep it in stock, because everybody else wants it, too. It just walks out the door. And he had sold the last copy he had only that morning. No, I don’t remember the name of the pattern. But I want it. Badly. Remember… This was a pink object, and I was ga-ga over it. Yeah. It was that good. I didn’t do as well at Woolcott in sticking to my resolve to buy only yarns not available locally. But… I was pretty good. The picture is not so good because I realized as I was snapping it that it was getting late and Sean was trying to close, and, having made my purchaes, he probably would be OK with me actually leaving. 🙄 Although, to be fair, Sean was very nice and offered to take a picture of me in the shop. Not with my hair like this, I replied without even thinking. Sean giggled and thanked me for coming in. And here is the obligatory yarn pr0n. On the left, both from Windsor Buttons: Claudia in Navy Olive; and Schaefer Anne in a colorway that’s olive, gold, rust and berry. To the right, all from Woolcott: Mountain Colors Bearfoot in Tamarack (yes, I know I can get this at home, but it was so pretty and it talked to me, and we’ve already established that I have no resistance); Schaefer Anne in muted greens; and Woolcott & Co. silk/cashmere cobweb-weight that I think will probably be like knitting with clouds. I have 1326m of the last (about 1450 yds) and I’m looking for just the right project. Finally, I can’t resist sharing the Nahant fireworks with you. The fireworks are held every year on the beach that’s directly across from my cousins’ home. So naturally they invite friends over and gather on their porch to watch. The menu included guacamole (my contribution), lobster rolls (yum), a wonderful broccoli salad, Ceasar salad, fruit salad and canolis (to counteract all of the healthy stuff). The film was shot with my little camera — the same one that takes all of the pictures I show here — and represents less than 1/4 of the actual fireworks show. I would have had more, but I was so captivated by the display that I didn’t think to turn the camera on most of the time. I think it does pretty well on film of the good-enough-for-youtube variety. You can hear the crowd down on the beach, and cheers and comments from my fellow porch-sitters. At one point you will hear yours truly, in one of my more brilliant utterances, exclaim, “oh! oh!” to apparently nothing.